A broken street sign turned into an online contest at the Dutch university TU Delft earlier this month. The TU Delft Webcare Team challenged their social media fans to determine what wind speed led the sign to buckle over — and the winner happens to be a COMSOL user. Here’s how Rob Eling solved the street sign challenge using COMSOL Multiphysics. 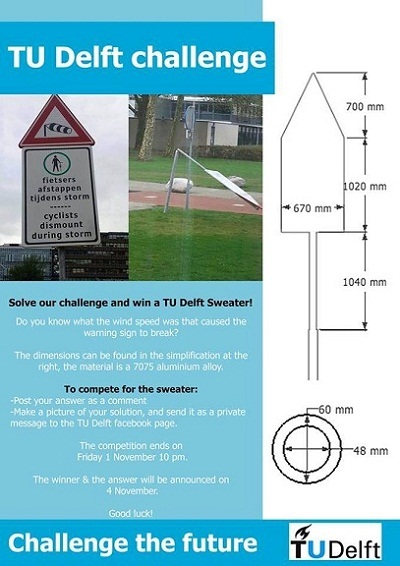 The contest rules were simple: figure out the wind speed that caused a certain traffic sign to break, submit the correct solution, and you will win a TU Delft sweater. As you can see below, they only gave contestants the dimensions of the sign and the material it was made of (7075 aluminum alloy). The challenge was posted by the TU Delft Webcare Team on the TU Delft Facebook page. 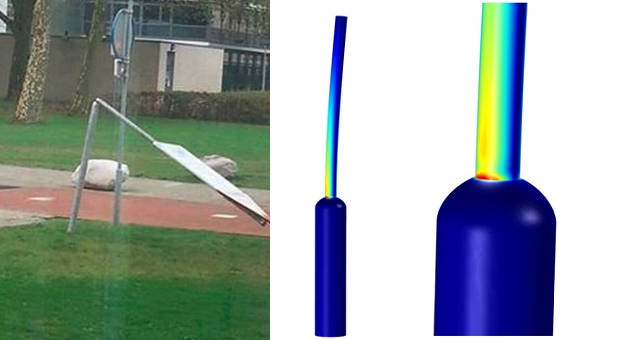 Rob Eling, MSc in Precision and Microsystems Engineering, ran a failure analysis of the sign under wind load in COMSOL, using coupled fluid-structure simulations. Rob shared his results with us, and now we’d like to share them with you. First, he performed a structural analysis of the traffic sign. In doing so, Rob determined that the structure failed when the tensile stress was too high. He ruled out compressive stress as the culprit when he analyzed the buckling of the compressive side and saw that it would require higher loads to have an impact on the failure mode. In a linear structural analysis, he also calculated the bending moment that led the ultimate tensile stress to be exceeded. Left: Failed sign. 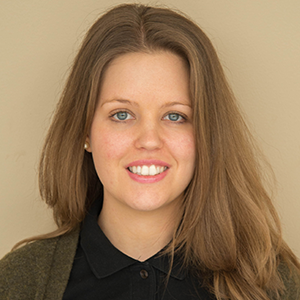 Image courtesy of TU Delft. Right: Structural mechanics analysis: The stress concentration appears at the neck (as shown in red). Image courtesy of Rob Eling. As we can see above to the right, the neck of the pole contains a high concentration of stress. Rob was careful to note that the presence of a weld at the neck is likely to have made the material there more brittle than the rest of the structure. He also mentioned that he did not take fatigue into account in the analysis, while in the real world, cyclic wind loading would in fact play a part in the structural failure of the street sign at lower wind speeds. Naturally, his next step involved setting up a coupled fluid-structure analysis. Here, he leveraged his previous results from the bending moment calculations as an order of magnitude estimation. Rob kept increasing the wind speed parameter until the ultimate tensile stress had been exceeded. 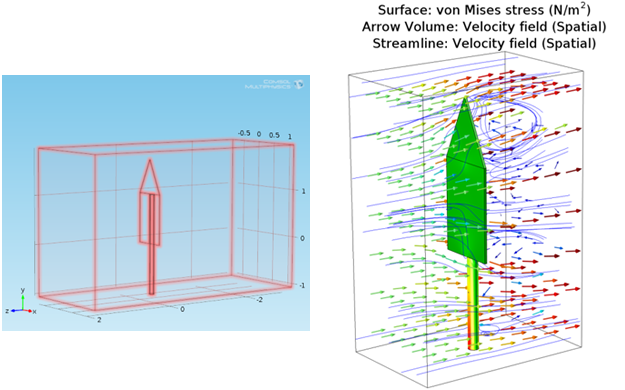 Left: The model geometry, depicting the sign inside a virtual wind tunnel, with the wind assumed to be flowing from the inlet (LHS) to the outlet (RHS). Right: Surface plot of the flow field and stress distribution in the sign. Image courtesy of Rob Eling. So what was the correct answer to the TU Delft challenge? The sign broke at a wind speed of 47.7 m/s. For his study, Rob assumed that the pole was fixed to the ground, but he notes that in reality this is not the case since the soil it is inserted into is soft. He further reiterated that he did not take weld defects or fatigue into account. Perhaps that’s for another study? Congratulations Rob Eling — and thanks for sharing your work with us! I hope you like your TU Delft sweater. Does anybody know where I could find this model? Thanks.